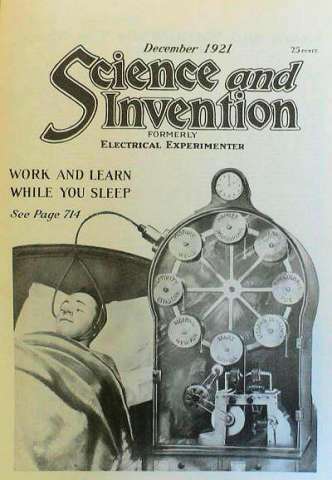 "Suppose it was possible to devise an apparatus whereby you could read a book, or study a language while you slept. Would it not be an inestimable boon to humanity?" The CNL recently started publishing teaching notes to encourage the reading of literature by Luxembourgish authors in schools. So far, three “dossiers pédagogiques” have been published: two in German (on Guy Helminger’s "Theater" and Joseph Funck’s "Kleines Schicksal") and one in French (on Jean Portante’s "Mrs Haroy ou la mémoire de la baleine"). There are more in the making … and a quick look through our telephot allows us to reveal that before long, we’ll present our very own guide to Hugo Gernsback’s "Ralph 124C 41+" … or, more precisely, to the extract found in the anthology "Literaresch Welten". What we cannot reveal, however, is whether these notes will be available for the "Learn while you sleep" device.